There is no doubt a lot of serious stuff when it comes to cats – cat overpopulation on the streets and in the shelters is a subject we have been trying to tackle for months now and there is still a long way to go before the problem is solved. But, sometimes we need a break from all that heavy stuff, just to talk about cats being cats…. or what I called in Chapter 22 of my book, “Cattitude & Cattisms.” This chapter was so much fun for me to write, because it is all about the universally wonderful personality traits, habits, quirks, and mannerisms that our cats possess to one degree or another to let us humans know we are NOT in charge. I define “cattitude” as the by-law of rules a cat has over the household as defined by the haughty superiority they innately have over the human species and “cattisms” as the uncontrollable and neurotic habits or behaviors a human exhibits because he/she is obsessed with his/her cats. Cat Rule #3 – Company & Dinner Parties. It is best to jump on dining room table, kitchen counter, and any other area where food preparation and eating occurs by humans when you have a crowd of people or a big event like Thanksgiving. This embarrasses humans as they try to pretend this is the first time you have done this and scold you to get down. Lick stick of butter on counter before it makes it to dining room table. Casually jump on top of set table as if this is the most obvious thing to do. Yawn. Stretch. Then swish tail in the plate of as many dishes of food you can at one time for an added effect. Having an unexpected sneeze spasm at this time is also recommended. Guests that are wearing fancy holiday clothing, especially ruby reds, emerald greens, and royal blues, should be rubbed upon by a lighter colored cat. Those wearing whites and pastel outfits should be rubbed upon by a cat with darker fur. If the guest tries to politely shoo you away, remain vigilante and rub again. They will eventually give up in defeat, at which point your job is done and you can move on to stage “two” – ignoring guest who is true cat lover who has been trying to get your attention all night. Hold head high, act terrified and treat with aloof disdain. To further embarrass your human around company, pretend you do not know your name and ignore your human when called. Humans love to brag, “Oh yes, my kitty knows his/her name. He/she is so smart!” Obviously you know your name. What are you, some kind of trained monkey, or worse yet, a dog? Become completely mute and lie frozen wherever you are at the moment. Whatever you do, don’t fetch toys or do anything remotely “cute.” It is mandatory to maintain the stereotype that all cats are aloof, independent, and unfriendly. When guests leave, come when called by name and do a circus juggling act while riding a unicycle. Cat Rule #12 – Bedtime. DO NOT EVER LET YOUR HUMAN FOOL YOU THAT THEY WANT TO GET SOME “SLEEP.” They enjoy being woken up by you at the break of dawn and always welcome your company. You are very well rested by your 18 hour nap you had during the day and your human should respect that. Lying on your human’s head, biting toes, kneading stomach, loudly meowing, and scratching bed work well to wake your human up. If your human finds it necessary to pick you up and rudely remove you from the bedroom, shutting the door in your face to go back to “sleep,” continue with process anyhow. Your human is just testing you and you have far more patience in the early hours of the day than they do. Continuously scratch door or find a bull-horn and meow incessantly. Persevere and remain patient. You will be rendered victorious at some point. Once you have successfully woken your human so that they are incapable of going back to sleep, ignore them. This is no longer challenging and you are bored. Time for a nap. All computer screen savers and cell phones must have a picture of one or more of our cats on it. Every password and email for anything must be related to one or more pet. When choosing what team to win at a sporting event, it is determined by which team is named after a cat. If there are no cats playing, then the next determination would be a horse, then a bird. If no animal teams are playing, there is no point in watching the game and you just need to change the channel. This method should also be used when playing in a football pool. Male co-workers who study stats faithfully, particularly enjoy losing to a female who makes bets based solely on feline projections. You buy your cat a birthday cake and present(s) to celebrate their birthday. You also make them wear a pointy birthday hat. 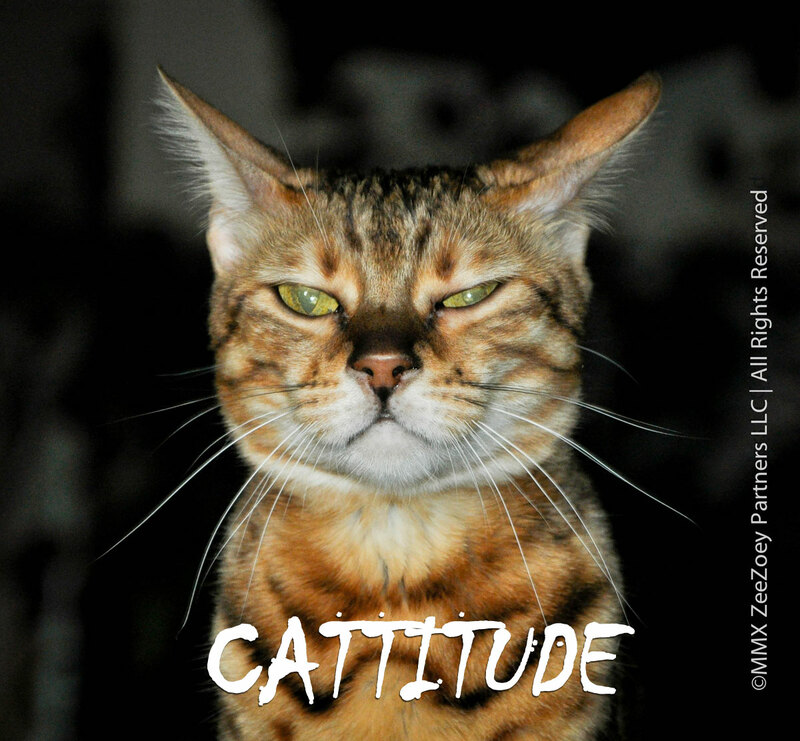 You couldn’t have picked a better photo for this post – now that is serious cattitude! That’s for sure Ingrid! Zoey could be the poster child for cats! Love this and this was one of my favorite parts of your book. Number 4…Cody’s birthday is tomorrow. Nope, I didn’t buy him a cake (allergies) and I don’t make him wear a birthday hat (at least in real life, just in touching up photos lol) Cody would never DREAM of allowing me to put a hat on him. He isn’t a “dress up” kinda guy…but presents! Ohhhhhhhh yessssss I bought him a slew! Oh my goodness Caren – Happy early BD to Cody! I don’t make my kitties wear party hats either, I am certain I would not live to tell about it… Photoshop hats, that’s another story! But, I did put a birthday hat on my dog, Bandit! Glad you enjoyed the post! That’s the universal “And humans are at the top of the food chain?” look. Sometimes I think I’m putting up with their “little habits” and then I find out they are putting up with mine. What they don’t have to do to maintain the standard of living to which they are accustomed. Bernadette – you crack me up!! This warmed up my morning on a dreary, rainy cold day! Cattitude is a personality trait which some cats have in spades and I believe there are sub-CATegories. #3 is our fave. Layla – I am visiting Dan’s kids in Boston today and it is horribly cold and dreary!!! Glad you enjoyed the post – I love number 3 too!! Hi, we are stopping by from the Saturday hop! Love your Cattisms..the only Catechism we knew about was the book our Mom has from Church!! MOL!! Shawn – thanks for stopping by for the hop!! Very cute response! You already know from my review that this was one of my favorite chapters. There are just some things that only cat lovers can appreciate, and these are a fine example!! Thanks Julia – since the book has been written, I could probably add a dozen more! Happy to return the favor Carolyn, you know Austin always gives me a smile! FaRAdaY: *raises paw* we discovered a pawesome bullhorn! Meowing into the vent directly below Mommy & Daddy’s bedroom creates a wonderfully resonant amplification. *modest look* I thought that one up all by myself. I did. Oh faraday! You to have cattitude! That is very clever! I find it poetic justice that after years of my mom looking down on my housekeeping skills because of my pets, that when I visited her on Christmas I found a huge hairball that had been coughed up on her fancy living room sofa. MOL Jen!! That is priceless! Hugs to you and everyone there. Thanks meowmeowmans – it was such a fun chapter to write… the best part, it was all true!! !